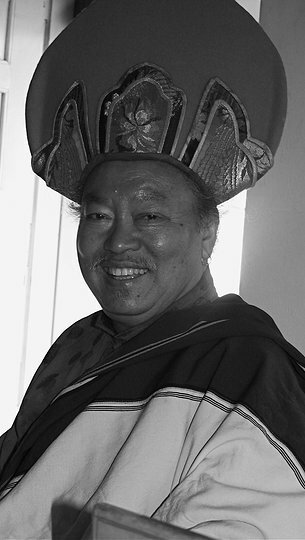 Lopön Ogyan Tanzin Rinpoche is a Nyingma Vajrayana master, a scholar and a senior student of Dudjom Rinpoche. Originally from Pemakö, he was born into a family of ngakpa descending from the tertön Pema Lingpa, an important tertön from Bhutan. On his father side, Lopön Ogyan Tanzin Rinpoche is also a descendent of Jikme Kundrol Namgyal, who is his great great grand-father . Lopön Ogyan Tanzin Rinpoche also have very close family relations with Dudjom Rinpoche as his great great grand-father married Dudjom Rinpoche’s father’s sister, who was from Pumo ; and as one of his uncle Chonyi Rinpoche  married Semo Dechen Yudron, the eldest daughter of Dudjom Rinpoche. When he was six years old, Lopön Ogyan Tanzin Rinpoche went with his mother to Dechen Chöling, Dudjom Rinpoche’s main place in Pemakö, to visit Namgyal Drolma. Lopön Ogyan Tanzin Rinpoche's main teacher is Dudjom Rinpoche, and his retreat master was Changchak Rinpoche. All of them were instructed by Dudjom Rinpoche to develop ngakpa institutions and help preserve this lay practitioner ‘s tradition of the nyingma. Lopön Ogyan Tanzin Rinpoche is a ngakpa and is keen to see this tantric ordination flourish in the West as it has for over a thousand years in the Himalayas and Tibet. He is the spiritual director of Ogyan Chokhor Ling (the European sangha of his students) and the director of Lhundrup Topgye Ling Ngakpa Dratsang School (in Arunachal Pradesh, India). He has a particular gift for languages, as he is fluent in Tibetan, Sanskrit, Tshang-lha, Hindi, Bengali, Nepali and can easily communicated in English with great simplicity. Lopön Ogyan Tanzin Rinpoche is also a respected academic with a teaching career of three decades in higher education. His academic qualifications include: Sastri Pariksa (B.A.) 1975, Sampurnananda Sanskrit University, Varanasi; Senior Diploma (M.A.) First Class, in Tibetan Language and Literature, 1977 Visva-bharati University Santiniketan, West Bengal; Acharya in Tibetan Nyingma Philosophy (Lopon ) 1979 International Indo-Tibetan Buddhist Cultural Preservation Society, Kalimpong. He has held a number of teaching posts in higher education: Lecturer in Tibetan Language and Literature, Central Institute of Higher Tibetan Studies, Sarnath, 1979-1994; Visiting Lecturer in Kelaniya University, Colombo, Sri Lanka, 1998; Academic Consultant, University of Cardiff, UK, 2006-2009; Academic Consultant, University of Oxford (ongoing). Lopön Ogyan Tanzin Rinpoche is the inspiration behind Khye’u-chung Lotsapa Translations, which produces English (and other European language) translations and editions of Tibetan texts belonging to the Dudjom Tersar tradition. He is also presently working on a Tshangs-lha-Tibetan dictionary, with the aim of recording and preserving the rich vocabulary of the Tshangs-lha language, which is now in danger of extinction. Lopön Ogyan Tanzin Rinpoche resides in Varanasi and frequently visits his centre in Arunachal Pradesh. ↑ Jikme Kundrol Namgyal’s son was Lopon Delek Wangchuk. Lopon Delek Wangchuk’s son was Lama Dona (who moved to Pemakö). Lama Dona’s son was called Lama Pema Rapten. And Lopön Ogyan Tanzin Rinpoche is the son of Lama Pema Rapten. ↑ From his mother side. This page was last edited on 30 July 2014, at 21:52.